Angus has been sitting around with his waistcoat flapping open for weeks. I just knew that I was not going to find a tiny black button anywhere, so yesterday we took out the clay and made some! Buttons for miniature bears are easy to make. In this post I'm going to share a few tips for making professional looking buttons. Although you can use home made cold porcelain, I recommend using polymer clay, it is a little bit stronger. So get out your clay and let's get started! Roll out sheets of clay to the thickness desired for the buttons. You will need cutters to make the shapes. For round buttons I press into service a variety of things found around my workroom. Straws, bottle caps, plastic pen cylinders and caps from felt tip pens all become good cutters. I have tiny Kemper cutters that make shapes such as hearts and stars. If you don't have a set, don't be jealous. Here's a tutorial to make your own at no cost. My secret weapon when making buttons is cling wrap. Lay a sheet of cling wrap over the clay before you start cutting out shapes. It will keep the cutters clean and prevent buttons from sticking inside the tiny cutters where you can't easily get them out. It will also give the surface of your buttons a nice bevelled edge. Neat! Buttons on the left were cut with cling wrap, and buttons on the right without. I like the way the cling wrap bevels the top surface of the button. Use a stylus or toothpick to make holes in the buttons. Four holes are possible, but tiny buttons work better with only two holes. Here's another good tip - tape two pins or two toothpicks together and use them to make evenly spaced holes. Here's some button inspiration to get your creative juices flowing. When you have made enough buttons, bake them on a flat surface such as a ceramic tile. Next time we are going to (try to) take a closer look at invisible sewing thread. My book page for Lesson 17. Thank you Joyce, I'm still having fun with Project 52 and stretching my imagination for future posts. Glad you are enjoying them too. Wow Megan these are great. Thank you. What a lovely idea. I will certainly give it a try. Glad you liked the buttons Maggie. 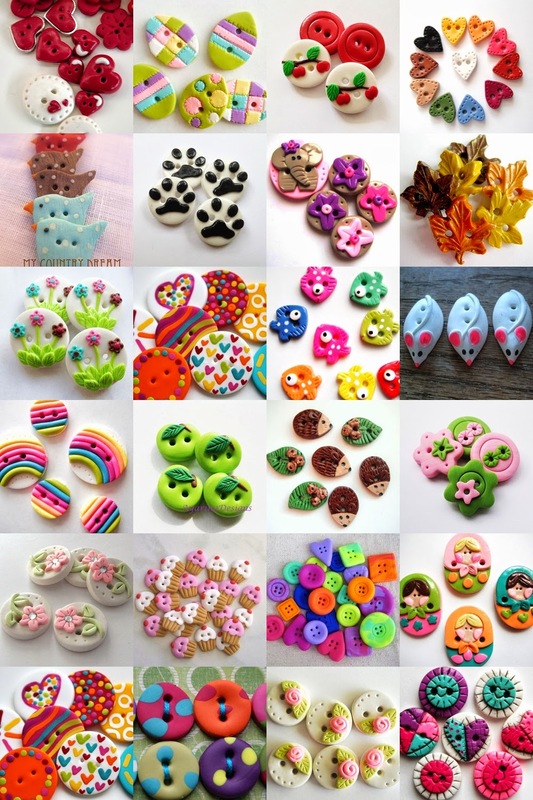 You have so many talents, I'm sure you can think up heaps of things to do with hand made buttons! Thanks for sharing. I didn't know about the glad wrap.